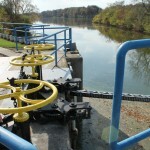 We’ve had a few inquiries about water in locks that are closed for the summer, specifically in Kaukauna. Due to the lack of water flow in the shuttered locks, there’s a build-up of debris and algae in the lock channel. To mitigate that, we will be flushing the closed locks a few times a month to get the water flow moving and clear out the channel. This isn’t a perfect solution as water quality depends on weather, so please bear with us as we continue to maintain the lock system–even the locks that are not open to navigation. If you have any questions or suggestions, please email us at info@foxlocks.org.